… has just been approved by Apple and is now processing for the App Store!! Please also update all remote’s to the latest versions. … has just been released by Apple. … has been released tonight by Apple. 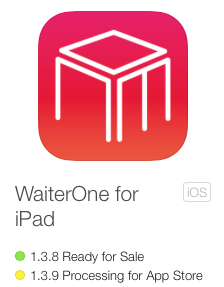 Now urgently waiting for the release of WaiterOne 1.3.9.